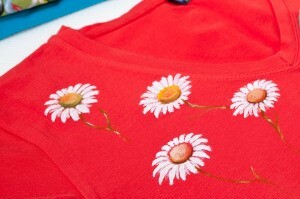 Painting designs on red or dark colored shirts can often require a base coat of a lighter color so the design can pop. This is a guide about how to paint a red t-shirt. I am applying acrylic paint on a red t-shirt and the red is bleeding thru the acrylic. How can I prevent this from happening? The shirt has been laundered several times. I have put 5 or 6 coats of flesh color on it and the red is still bleeding thru. It has been my experience with painting on T-shirts, you'll need to buy special paint to do this with. Just using an acrylic spray paint in the can won't work for T-shirts. The paint is a water based paint and because of this the color from underneath will bleed through. Some acrylic paints are made for paper and canvas. But there are also some acrylic paints for fabrics - you might go with that instead. Or, you might need a medium (paint thinner). You could ask your local craft store. Red is rated as the color to "most likely fade/run/bleed" so you may always have trouble with the red bleeding any time it is laundered. There are special paints for material but red is a strong color so if you are trying to put white on red it will probably never work the way you want it to. I believe you will have to try and make your T-shirt colorfast before applying the paint or it will run into the "white" area every time it is laundered. There is a lot of controversy about whether salt or vinegar will "set" the dye but it seems that it may depend on the material, temperature of water, as well as other factors. If you are able to paint your shirt without bleeding, I would recommend you use something like "color catcher" in every wash. Your local craft stores may have some suggestions, especially about what color to use on red cloth. Is textile medium the same thing as floating medium? It was suggested in my answer to painting t-shirts that I mix it with my acrylic paints. Is there any difference in them? Your best bet is to buy a fabric paint that is rated for T-shirt material. I saw another post on here where a person used spray acrylic paint on their shirts and it bleeds through. This is a water based paint and it will bleed through. I personally think you'll like the results much better. I've painted on shirts before and the only way to actually make them look good is with the fabric paint.